Over the years, some pretty important bits of London have, one way or another, found their way stateside. Here's a list of the real gems. By the way, museums are exempt. Otherwise it'd be anarchy (no longer in the UK). 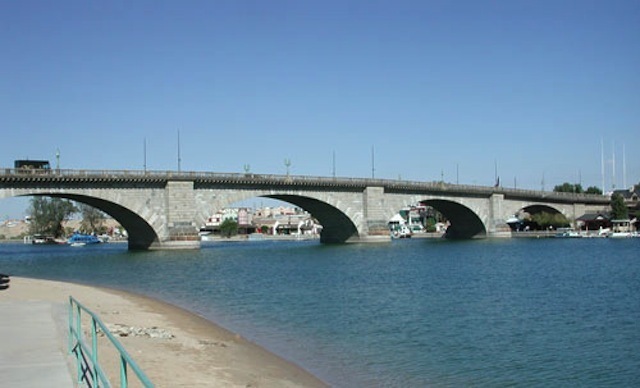 London Bridge in Arizona, by Aran Johnson under Creative Commons. Those pesky over-the-ponders only went and took our good old London Bridge. Okay, it wasn't the really good (medieval) London Bridge. But it was John Rennie's elegant 19th century design; vastly more handsome than what we have now. Entrepreneur Robert P McCulloch snapped up the bridge from the Common Council of the City of London in 1968 for just $2,460,000. It was taken apart, the pieces numbered, shipped to Arizona, and rebuilt block-by-block in Lake Havasu City. Rumours that McCulloch thought he'd in fact purchased Tower Bridge seem far-fetched. Travis Elborough has published a book on the episode, London Bridge in America: The Tall Story of a Transatlantic Crossing. Go to Chicago's Tribune Tower and you'll see a host of stones and slabs from iconic structures set into its base (including the Parthenon, L'Arc de Triomphe, and the Great Wall of China). London magnanimously donated two fragments, one from Westminster Abbey, the other from the Palace of Westminster (specifically, the House of Commons). In Fulton, Missouri, they've gone one better. St Mary Aldermanbury was built by Christopher Wren after the original was razed in 1666. Following the destruction of Wren's church in 1940, it was clear London could no longer be trusted with St Mary Aldermanbury. 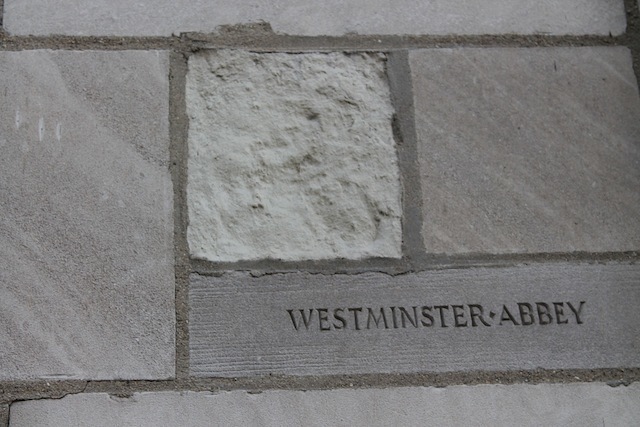 The stones were transported to Westminster College, Missouri in 1966 (where Churchill gave his famous 'Iron Curtain' speech), and pieced back together in the grounds there. It hasn't fallen down since. Leytonstone-born Alfred Hitchcock used London as a backdrop for many of his movies (famously the Royal Albert Hall in The Man Who Knew Too Much, and a gloomy Covent Garden in Frenzy). Yet Hitch didn't much fancy spending the rest of all time in London; hence his final resting place is in Bel Air. Another Londoner lost forever to LA is Liz Taylor (born in Hampstead Garden Suburb, interred in Forest Lawn Memorial Park, Glendale). Dudley Moore was a Dagenham boy done good; good enough to not be buried in Dagenham. You'll now find Dud in Scotch Plains, New Jersey. Ah, the Liberty Bell. That which was proudly struck to mark George Washington's birthday; that which was adopted by abolitionists as the ultimate symbol of freedom. That grand old American Liberty Bell. 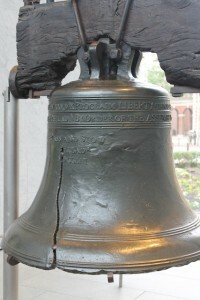 Thing is, the Liberty Bell was actually cast in the Whitechapel Bell Foundry, east London. It can't have been their finest work either, because the thing repeatedly cracked. Oh, and though the rule was no museums, this one's actually located in Philadelphia’s Liberty Bell Center. So ner. London is popular in the States. As a moniker, that is. There's a New London in Connecticut, a London in Kentucky, a London Township and a New London in Minnesota, a New London in Missouri, a New London in New Hampshire, a New London Township in Pennsylvania, a London in Tennessee, a London in Texas, a London in West Virginia, and a New London in Wisconsin. There are two Londons in Ohio. Simply greedy.